Bake a sheet cake the size that you need. Make a ivory icing and ice the cake making sure it is nice and smooth. Now make a dark golden colored icing. Using tip #32 and an empty icing bag place a narrow strip of the dark golden icing in the empty bag. Fill the bag with the ivory icing. Now make an oval shell border on the cake top. Later you will put the person's age in this oval. Make a shell border on the top and bottom edges of the sides of the cake. Using the rose tip #125 and an empty decorating bag do the same stripping procedure with the dark golden icing, then filling the bag with the ivory icing. Make the roses and place them around the oval as shown, and one in the bottom corner. Do the same procedure with the leaf tip #352 and an empty decorating bag and make leaves around all the roses. 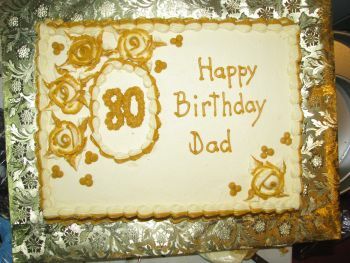 Now use the dark golden icing and round tip #5 and make three dot clusters around the roses. Write your Birthday Message on the cake.